Beer and Wine. With kids. It's possible. | The House of Martins The House of Martins: Beer and Wine. With kids. It's possible. Beer and Wine. With kids. It's possible. I love going wine tasting or trying a new beer at a small local brewery, but for a while I thought those days were behind me - at least until my kids are a little (or a lot) older. But to my surprise I have found some kid-friendly options for small breweries and wineries. Seems it might not be as hard as I thought. Here are four options local to the Sacramento area that we've enjoyed with our kiddos. 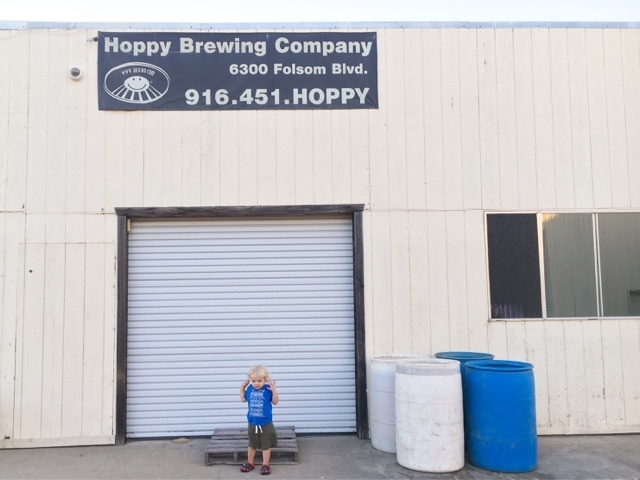 Hoppy Brewing Company - I have an AMAZING secret about this place. Go on a Sunday with the kids. It is $1 kid meals AND with every full entree adult purchase you get a 22 ounce bottle of Hoppy included to-go. I know, you can thank me later. See you there! Bike Dog Brewing Co. - I tweeted them to ask about bring the kids - and they said, yes - please do. Which was great... but I was a little worried that didn't mean our evening would be easy. They had a little dump truck that Lucille spent a lot of time pushing around, some blocks that kids were building towers with and there were in fact a LOT of young kids there. I recommend you check what food truck is going to be there - because you'll want it to be one that works for your kiddos or you just bring your own. Either way the food is probably the hardest part but we had Culinerdy Cruzer and it was perfect. Weibel Family Tasting Room - If you make your way to Lodi for wine tasting with your kiddos this is a great first stop. It is downtown so you can first pick up some cheese at Cheese Central next store then stop here for some great champagne. The tasting counter (and surrounding tables) all have glass tops and they give you a whiteboard type pen so you can write on the glass which wines you want to taste. Well when we went - they gave the kids a handful of these pens too and they sat at a nearby table and drew on the glass while we tasted. It was a great amazing tasting experience, good champagne and such friendly staff. Any places you would like to add? I'd love to here about them.